Mark Angus is an award-winning video game Audio Director and Linear Sound Designer. With nearly twenty years of experience working in sound, he has headed up audio on a number of projects, including the BAFTA winning Alien: Isolation. Over the years Mark has worked on over a dozen video game titles, including many AAA and Hollywood franchises, for companies such as EA, Sega and Microsoft, as well as having film and television credits to his name. Hey Mark! Firstly, for those of us who don’t know, can you explain what a ‘Sound Designer’ is? A Sound Designer is somebody who makes sound effects, whether for film, television or video games. Sound Design encompasses a lot of different things — recording sound, editing sound, putting material together to make new effects, adding it to moving image, and so on. Can you give us a brief insight into your career so far? After university, I originally went on to become a musician. I DJed and I wrote my own electronic music, I was in a band and I ran my own record label. However, when I reached my late twenties, I decided to retrain. 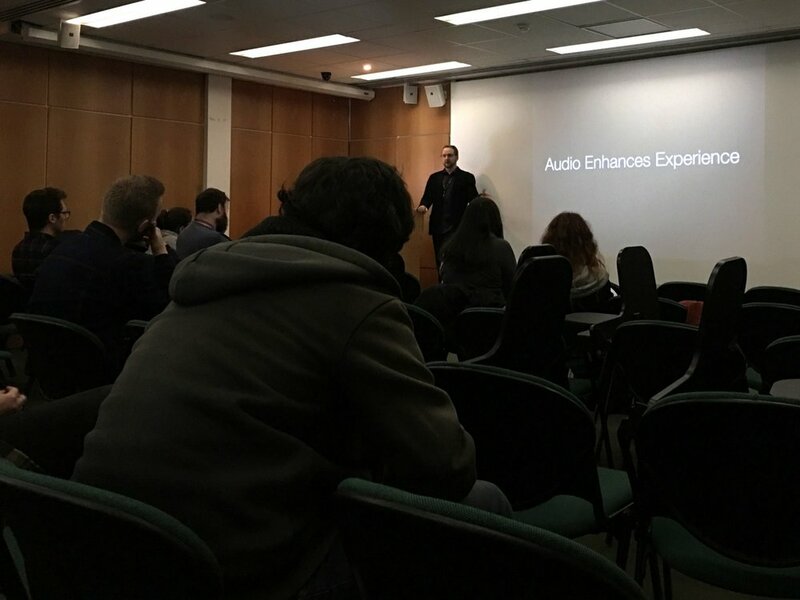 I went back to university to study a postgraduate degree in Sound Design for the Moving Image, with a view to getting into the Gaming industry afterwards. For a couple of years, I worked on a few small features and some indie work, and eventually I landed a job at Electronic Arts, a leading global interactive entertainment software company. This was my first job in the Gaming industry and I’ve been working on games ever since. If you didn’t initially study Sound Design, how did you get into the industry? I originally studied English at Oxford University and then basically ripped that up and went off to be a musician! I was gigging a few times a week and living the life of a musician, which was great for a little while. After some time, I realised I wanted to settle down, maybe get a house and get married, so I decided I wanted to do something else. A friend of mine was working for Electronic Arts at the time, and he told me about the guys he worked with who made the sounds for the games. He explained about the big recording studios where they work together to create exciting new sounds. I instantly thought… I could do that. I had played games all my life and gaming had always been a part of my culture as a musician and artist, but it never occurred to me that Sound Designing was something I could do as a job! As it hadn’t really been a career option for long, most people getting into the industry had a music background like myself. I went and did the postgraduate degree, where I learned all about film and telly and linear sound — but always with the mind I wanted to get into video games. What are some of your career highlights? What are you most proud of? We won a BAFTA for Alien: Isolation, which was definitely a highlight of my career. Other than that, I also really enjoyed working on the Harry Potter games. In terms of learning the depth of detail about the industry, it was fantastic. These games had huge budgets and they sold a lot of copies. There was a tonne of dialogue to record and some really inspiring composers working in the team. I learnt an awful lot working on a franchise that has a lot of passionate fans — it felt like what we were creating really mattered. What are some of the main differences in the Sound Design industry now, compared to when you first started? The quality standards and expectations of sound effects has increased hugely over the years. Budgets have gone up, the size of teams has gone up, and the amount of material required has gone up. For a big budget title, back when I first started, I worked in a team of two people. By the time I was Lead Audio Director, working with composers, sound designers and so on, there totalled about 16 people in the team. Do you have any advice for aspiring Sound Designers? My advice for students is always to get involved in as many projects as you can outside of just the syllabus on your course. For me, the real value of my postgrad was not just the lessons I learnt, but the people I worked with. I went and volunteered on student films and got involved in any project I could. Some of my peers went on to be film and television directors, or worked in the video game industry. Importantly, I learnt about being a part of a team. Working collaboratively is a really big part of the gaming industry. So, go and find the film students, find the performing arts students, and offer to do some sound design for them. You never know you might be working with them again in the future!